(a) Depress the brake pedal and hold it. 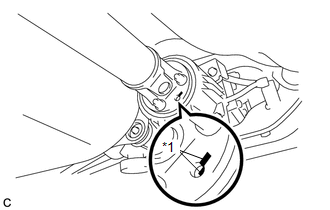 (b) Using a hexagon wrench (6 mm), loosen the cross groove joint set bolts 1/2 turn. 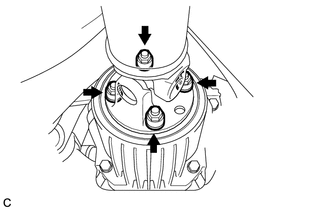 Put a piece of cloth or equivalent into the inside of the universal joint cover so that the boot does not touch the inside of the universal joint cover. Do not remove the bolts. (c) Place matchmarks on the rear propeller shaft and electromagnetic control coupling assembly. (d) Remove the 4 nuts and 4 washers. (e) Using a brass bar and a hammer, separate the propeller with center bearing shaft assembly. (f) Remove the 4 bolts, 2 No. 1 center support bearing washers and 2 No. 2 center support bearing washers. When removing the bolts and washers, do not apply excessive force to the universal joint. 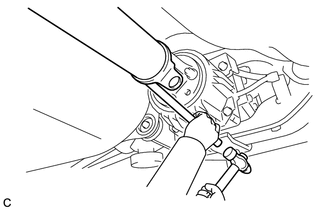 (g) Pull out the propeller with center bearing shaft assembly from the transfer. 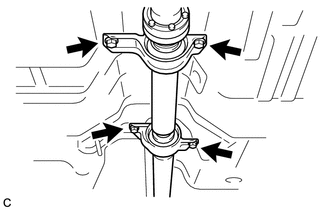 When removing the propeller shaft, do not apply excessive force to the universal joint. 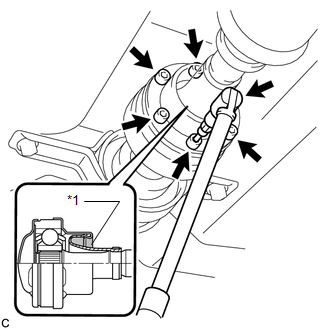 During and after the removal of the propeller shaft, keep the universal joint angle straight (within 15 degrees). Be careful not to damage the oil seal. 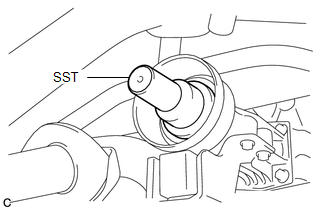 (h) Insert SST into the transfer to prevent oil leaks.